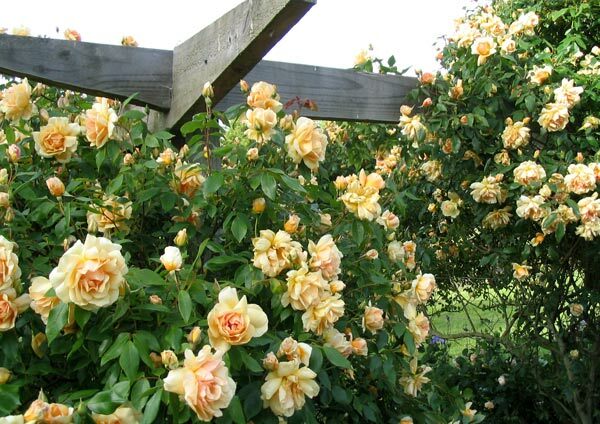 It's the summer of 2004 and finally the pergola is completely covered by climbing roses (mainly the thornless apricot rose Crepuscule). It has only taken four and a half years - such a short time in a garden's life. The pergola covers a natural pathway, and was erected in the winter of 2000 on the back lawn to channel people towards Middle Bridge and the gardens beyond it over the water race. On one side is the new rose garden, created in the space which the potager had first claim to. The roses tricked their way in here by first being merely "heeled in", then refusing to leave. The other side was originally fully occupied by a large gum tree. When the tree was felled the area became the compost heap. 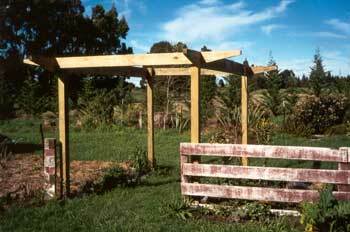 A brand new pergola cannot really have a compost heap to one side, so the heap was shifted sideways and more roses installed (just to balance the other side, you understand). Of course the spaces in the soil were filled up with assorted perennials and irises - just until the vegetable season started. That was the theory, anyway. 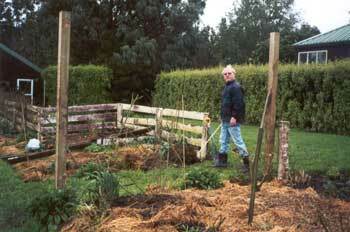 A variety of tall bush roses and climbing roses were planted to cover the wooden structure. 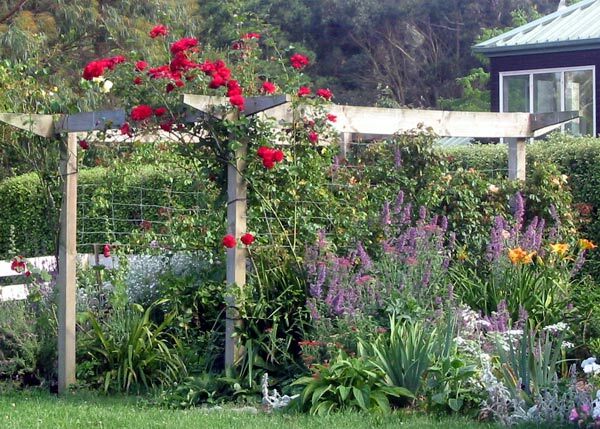 Many were gifted to me, and they included a Crepuscule, Casino, the Gerbe rose, and a sprawling Felicia. A pushy climber with fat canes which my friend assured me was Lavender Lassie took pride of place in the middle. Smaller roses like Mary rose filled out the spaces in the adjacent garden. New pergolas are larger than life structures, and feel so spacious underneath, before the growth from the climbers has lowered the ceiling. And you'll note that I've opted for that natural weathered wood finish. In other words I didn't ever get around to painting it. The two side gardens have good soil, and the masses of sprouting potatoes are proof that both these areas were once the final resting place of the kitchen scraps. Various perennials have come and gone in here - for example a trio of pink delphiniums spent one summer with white clary sages grown from seed. One year blue sweet peas made the walk through the pergola a very fragrant experience. A small seedling of Ligularia arrived somehow, and has started a larger colony. 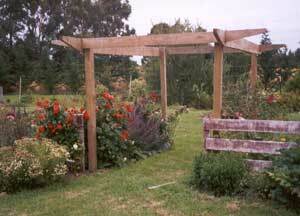 The roses have grown well and now almost cover the pergola structure. But the initial colour scheme was ghastly, even with the wide backdrop of country lawns and far-off trees. The rose posing as Lavender Lassie has been relocated, and the pink Gerbe rose will be next. 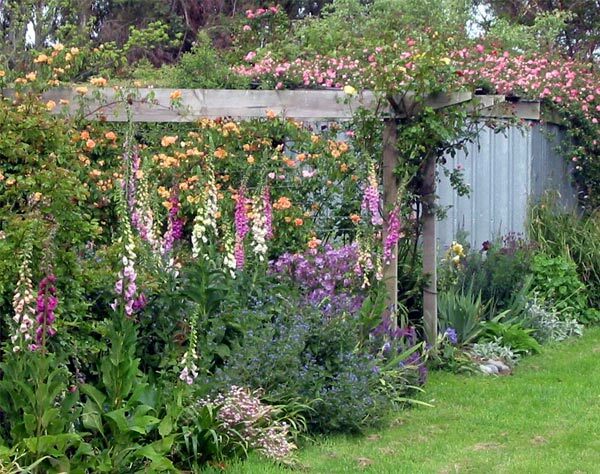 This will leave the big red, the soft lemon Casino, and the apricot Crepuscule, whose new growth is reddish, as the main inhabitants, and the Pergola will finally be able to stand tall in Mooseys, colour co-ordinated.